Anymore in the sci-fi films I watch – and, full disclosure, it is not my preferred genre – I feel as if the sci gets the shaft in the name of the fi, and that the fi too often drifts toward straight horror. This is not to suggest I’m pleading for nuts and bolts science. The finer points of scientifically minded movies are likely to go swooping right over the top of my generally useless pseudo-english lit head. And that’s fine. I don’t need specifics of the sci if the fi is well-handled and well-intentioned. 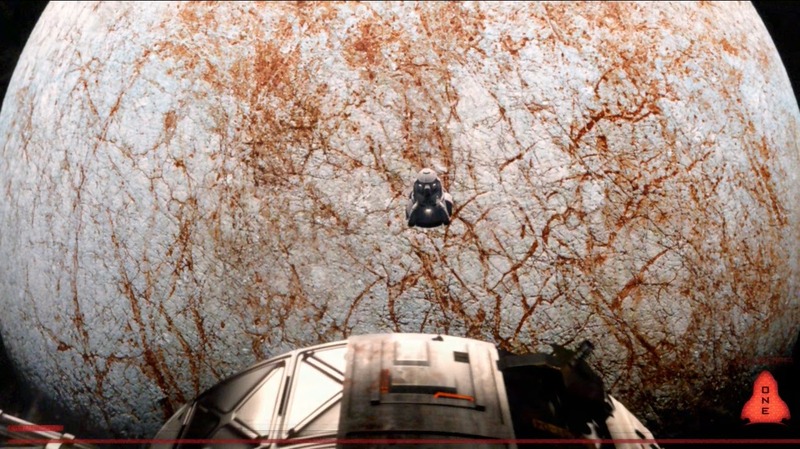 Take “Europa Report”, the 2013 sci-fi not-really-at-all extravaganza from director Sebastian Cordero. The gist is this: a team of six astronauts on a specially built spaceship make haste for Europa, the fourth largest moon of Jupiter, after potential signs of life have been detected. Well, we all know how these things work. There’s gonna be life, all right, but it’s going to be iniquitous life, Galilean fire-breathing monsters with spiked tentacles, or something of the sort, hell-bent on picking off our dear Earthlings one by one. Cordero quite cleverly uses those expectations against us. Relying on the recent trend of found footage, the narrative is told by interviews from the mission command back on Earth, confessionals from crew members and everything else caught on camera during their journey and eventual exploration once set down on Europa. This provides the necessary sensation that because the footage is found, something must have gone wrong. As they must, the crew lands all of one-hundred feet away from their intended set-down point. This causes problems, but they fashion solutions, intent on ferreting out proof of life beneath Europa’s icy surface whatever the means. In spite of those solutions, however, the mission still goes awry. Ominous chords appear on the soundtrack. “I saw something out there,” says a character, requisitely. Dread is ramped up as the ninety minute film progresses, but it patiently reveals itself to be something else. Initially your thought might be that these crew members and the decisions they make and the risks they take are outlandish. Except that once you have steered a spaceship all the way to Europa, the normal rules of engagement are altered. Every person aboard seems to sense this, and so while their scientific minds may tell them one thing, their dreamy minds tell them something else. It becomes a collaboration of sorts between science and the dreams of what science can find. And what they find……well, that’s not for me to say. The ultimate theme gets driven home a bit too broadly in dialogue form at the very end for my taste, and yet I wasn’t all that bothered by it. Perhaps this is because while so often deaths on the movie screen are simply for body count purposes (“Who’s next? !”), no one in “Europa Report” dies in vain. Enjoyed the tail end of your piece Nick. I have a screener for this one and look forward to catching up with it. Glad the site is still alive and well. Thanks, man! Appreciate it. Yeah, a friend told me I should really check this one out and then just a couple days later I got a screener of it in the mail. Fate.